Le Bourget. 22 June 2017. 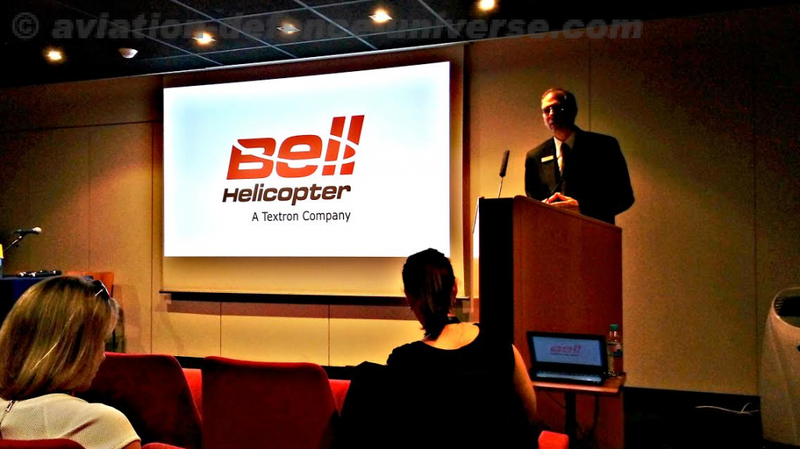 “I don’t like to say ‘we’re back’, but we’re back, and on a roll tide over the next couple of years.” This was the statement with which Bell Helicopter kicked off its return to the forefront of innovation at the Paris International Air Show . The American helicopter major presented its latest technological advancements, revealing the progress that has been covered and is projected over the next few years, whether in VTOLs, UAS’s, or Attack Helicopters, a feat which has culminated with the release of the Bell V-280 Valor and the increased sale of combat helicopters . As the progeny of the Bell Boeing V-22 Osprey, the V-280 comes with enhancements and modifications to the engine, and at its core is a weapons integration that is key to its development. This aircraft consists of the latest tilt rotor technology, allowing it to lift like a helicopter, yet fly like an airplane, surpassing the capabilities of any helicopter in the field, with improvements in virtually every sector. Double the speed, triple the payload, and quintuple the range, the V-280 is an innovation which further revolutionizes military effectiveness in all domains. The V-280 Valor possesses a combat range of 500 to 800nm, ensuring high-end fighting capabilities, and is strategically self-deployable from a range of 2100+ nm. It can hit a speed of 280 KTAS, holds a triple redundant fly-by-wire flight control system allowing for smoother control, and with a High/Hot 6k/95F Hover Out of Ground Effect (HOGE) performance. Furthermore, other than a crew of four, it can carry up to 14 troops and a load of over 5,400 kgs. Two wide 6 inch doors grant rapid entry and exit from the vehicle through the typical retractable landing gear. All of the above, with an enhanced field of vision. Due to its capabilities, the V-280 Valor has a range of increased proficiencies and deployment options. Higher range and speed double operational reach, with a productivity that reduces fuel consumption, maintenance costs, and deployed force structure. This further allows for an increase in range for medevac, 5 times greater than the typical medical evacuation helicopters. Bell Helicopters proceeded to reveal plans and projects for the Bell UH-1Y and AH-1Z. Tested and tried over the years in the field, the Bell UH-1Y is a helicopter that has been set to support the United States Marine Corps in operations across the globe for the next four decades. Known as the Yankee, it has a max speed of 170 KIAS, holds a combat range of 119 nm, and can carry 2 crew members and 8 passengers. As such, it is thus considered a versatile vehicle in handling threats as well as for the ingress and egress of personnel, no matter how unforgiving the circumstances. Initially deployed in 2009 with the United States Marine Corps, its origin reaches as far back as Vietnam, a combat helicopter that has been improved to suit contemporary conditions. On the other hand, the Bell AH-1Z, another staple of the United States Marine Corps, has been crafted to respond to military situations with precision and immediacy. A top speed of 200 KIAS allows for faster and further travel, where the 2 pilots are in control of a fully integratedd weapons, avionics and communications system. The enhanced line of sight provided by the Target Sight System increases combat radius to 131 nm, providing a wider scope for the only attack helicopter to have air-to-air combat capabilities. As such, the ‘Zulu’ is known for its advanced status as a combat helicopter. Bell Helicopter continued with the distribution of their attack helicopters. The latest Y & Z helicopters are in high demand, the delivery of which will be witnessed over the next few months. The US Government and numerous other countries have shown a vested interest in the latest Bell products. There are ongoing talks with Israel about requirements, with political and economical matters to be decided. Pakistan, on the other hand, have already received 3 of their 12 AH-1Z ‘Zulu’ attack helicopters this year, and are awaiting the other 9 that have been ordered.